Oh yeah, we could do that. Little did he know the extent of the riches at our disposal. 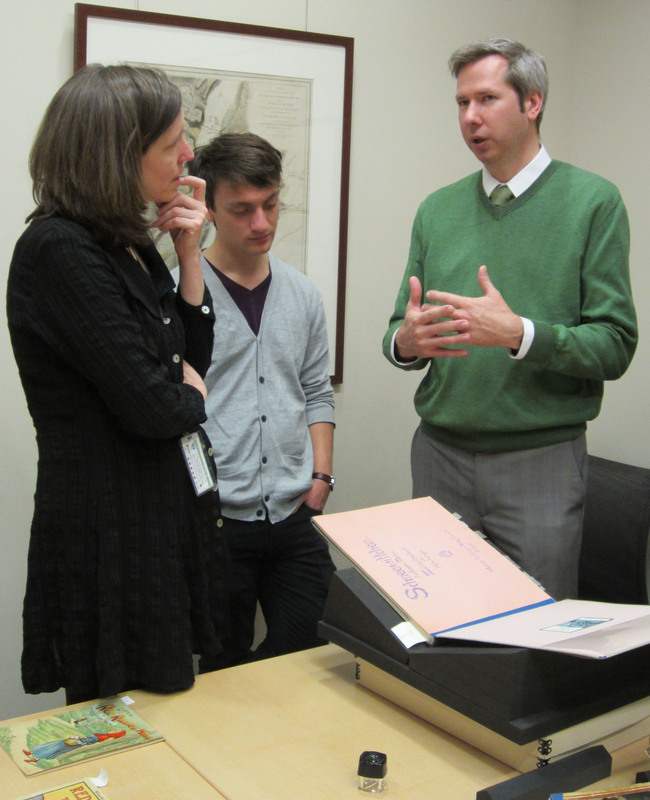 Curator Molly Schwartzburg wowed his class with an eclectic selection of some of the fascinating and visually stunning fairy tales that comprise our collections. In turn, Professor Ilsemann provided a great deal of insight on the history of fairy-tale publishing, and his students jumped in with comments based on the knowledge they’ve gained so far this semester. As is often the case, we wondered if we gained even more from the session than our visitors! 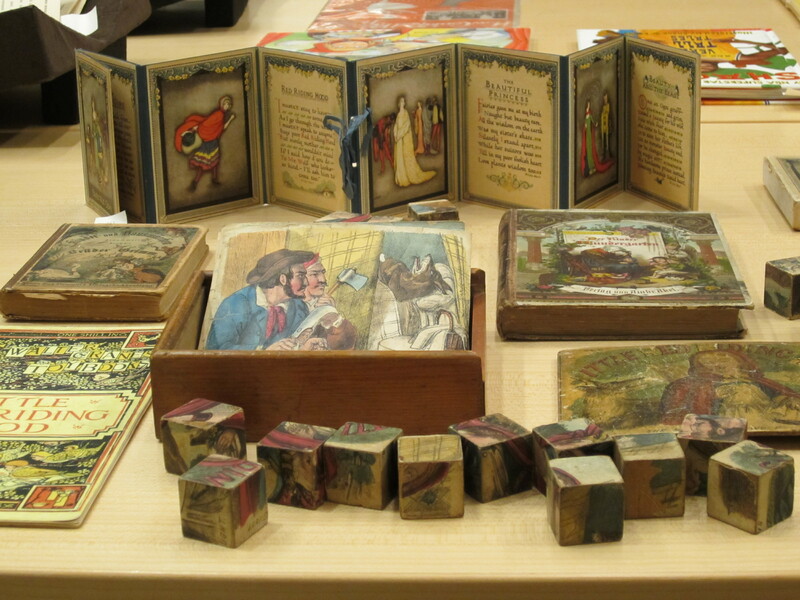 Many of the items we discussed were from Special Collections’s remarkable Little Red Riding Hood Collection, generously donated in 2007 by collector Martha Orr Davenport. 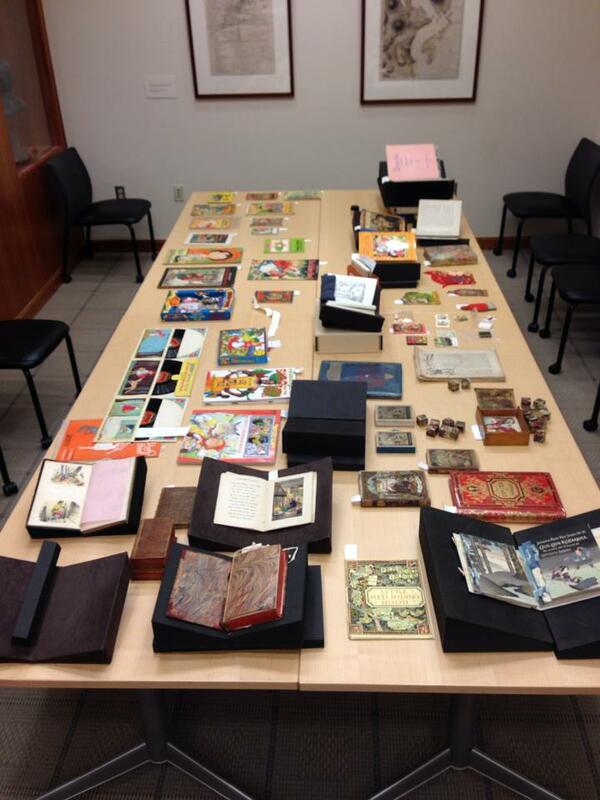 The collection comprises approximately 480 books, a hundred pieces of print ephemera, fifty works of art, ten magic lantern slides, and more than a hundred objects, including tableware, figurines, vases, pottery, puppets, recordings, and more. 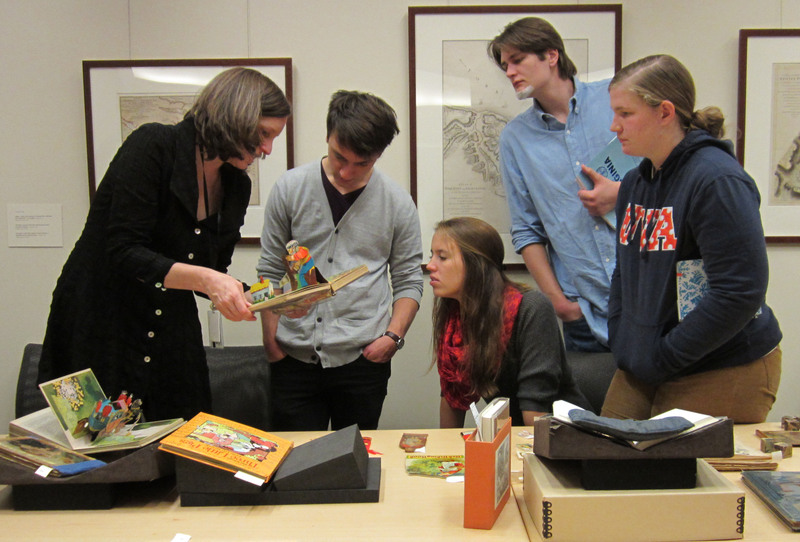 The students also were drawn in by several fabulous pop-up books from the Brenda Foreman Collection of Pop-Up and Moveable Books. Perhaps a student paper or two about these magical books will be in hand by the semester’s end, inspired by this wonderful introduction! 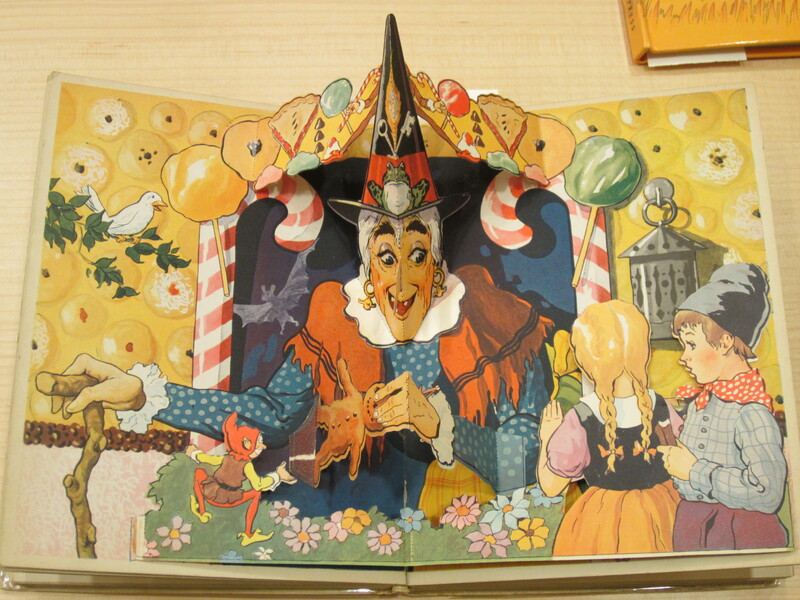 This entry was posted in Instruction and Outreach and tagged book collecting, book illustration, Brenda Forman Colleciton of Pop-Up and Moveable Books, children's books, fairy tales, Hansel and Gretel, Little Red Riding Hood, Martha Orr Davenport, miniature books, rare books, toys and games, Waldorf School by Petrina Jackson. Bookmark the permalink. I was able to find a fascinating brief biography of Langen’s sister Gerda, which includes some information on Hilde, at this link: http://biographien.kulturimpuls.org/detail.php?&id=807. it is in German, but if you put it into Google Translate and can make it through the messy translation, you learn that the sisters grew up with powerfully intellectual parents in a household closely affiliated with Rudolf Steiner and the Waldorf movement. Sorry not to have more for you, but that’s a start! I’m so glad you found our blog. I’m preparing a PowerPoint program on the history of illustrating Little Red Riding Hood. I had hoped to visit your library but the timing didn’t work out. I’m hoping you would email me, or send a print copy of an illustration of her by Perrault and one attributed to the Brothers Grimm. I have searched the internet and have not been able to verify an illustration from each. One of these days I hope to visit. The list of versions of this tale seems to grow by the minute, I saw a fish take-off the other day! I am a published author of a number of children’s books.